The name of Johann Georg Pisendel may be new to many, but he was regarded as one of the greatest violin virtuosi of his day. He was born in Cadolzburg near Nuremburg and as a boy he sang in the choir of the court of Georg Friedrich II, Margrave of Brandenburg-Ansbach. It was in Ansbach that he was taught to play the violin by the celebrated composer and violinist, Giuseppe Torelli who was the maestro di concerto there. After leaving Ansbach, Pisendel moved to Leipzig for further musical studies, meeting Johann Sebastian Bach on his way, and Georg Philipp Telemann when he arrived there. He became friends with both men. He took an active role in the musical life of Leipzig and was offered a position in the court orchestra at Darmstadt in 1711, which he declined. The following year he was offered a place in the Dresden court of Crown Prince Augustus, the future King Augustus III of Poland. Dresden then boasted the finest orchestra in the world. This time Pisendel accepted the job, staying in Dresden until his death. It was whilst at Dresden that Pisendel began compositional studies with the concert master of the court, Johann David Heinichen, Later he succeeded Heinichen as concert master. Augustus III often travelled, taking a small retinue of musicians with him, and it was on one of these trips that Pisendel first met Vivaldi, studying with him for a short time. It has been said that it was Pisendel who introduced the music of Vivaldi and the Italianate style to his friends Bach and Telemann. In Pisendel’s own music the influence of the Italian school is clear, but it is tempered with that of the German baroque, a synthesis of the two great traditions making his music something new and different. Of all his works the Sonata for Violin Solo in A minor is his best known, and this is probably why it has been suggested as an influence of Bach’s own solo violin writing. It is in four movements, the final one being a set of variations and it is easy to see why the link with Bach has been made. Of the three violin sonatas with bass continuo also presented here, the Italian influence is clearly there, but the sonatas lack some of the more bravura writing that was coming out of Italy at the time. Nonetheless these are still attractive and important works that show the progression and development of the later German baroque style. 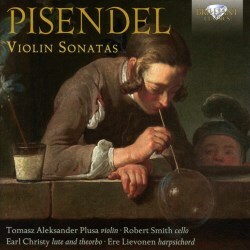 Thomasz Aleksander Plusa gives some good performances, although he sounds a little weak in the first Violin Sonata in C minor presented on this disc. In fact, he sounds more at home in the Sonata for Violin Solo; there he sounds more secure and relaxed in his playing. I have other recordings of Pisendel’s sonatas, mainly those by Martina Graulich on Carus (review) and Anton Steck on CPO (review), with Graulich being my first choice; Steck’s decision to have a continuo limited just to a harpsichord detracts a little from the music. That being said, this present disc would make an ideal investment for anyone interested in music of the period and looking to experiment. The Pisendel sonatas are interspersed with movements from lute sonatas by his almost direct contemporary, Silvius Leopold Weiss. The playing of these by Earl Christy is excellent and they make good foils to the violin pieces. I just wish that Brilliant had chosen to include a whole sonata rather than movements from two.